I am starting out to build a pair of 4343 speakers. My thoughts are, that wether or not to build the 4343B or the 4343A, depends on what kind of 10" I source(2121A or 2121H - I would prefer Ferrit magnets as I do not have remag capabilities on hand). And then build the 3143 network (Or the Charged coupled network, before I can source the original). I would very much like the speakers to look and sound as the 4343 speaker, as they were built "back then" - not doing something different that makes them something else. Just to be clear, (Because I have possibility to buy both 2122H and 2235H speakers) How different are these, in terms of the final product? Would you, knowledgeable people here, consider that to be wrong, or are they compatible replacements for the 2121 and 2231 drivers. It could be a point of "getting going" in the project, to buy 2122h and 2235H for now, build the speaker and then keep watch for 2121 and 2231 drivers along the way. But not if they are sonically "wrong". The short answer is if you can obtain a 2122H use it as in a 4344 at a later date or put it on ice. It’s a good upgrade path if you have a clapped out old 4343. My suggestion is acquire the 2122H now along with the 2235H to get you going. Build the baffle as a 4343 and use a new equivalent 3145 passive crossover for now. Buy a DR162425 diaphragm and put in the 2420 or buy a 2425 compression driver as the 3145 crossover is optimised for this driver. Thanks Ian - that goes well along the lines of my thoughts! I don't think I will change the diaphragms in my 2420's though as these are with red wax seals, and sounds amazing as is. Would putting foam surround on a pair of LE10A be a better option, in terms of matching the 2121 frequency response, so I can use the 3143 crossover and keep the 2420 diapragms? The crossover won’t be optimised but you can try it. The sensitivity of the 2420 and the 2405 will be way higher so the Lpads will need turning back -10 dB or more. I would normally look away from ever using an aftermarket kit, but this sounds interesting - I can't find the post/thread though? Using Google, the search feature in the forum is not very good. You need to contend with the authenticity on two fronts, component authenticity and performance authenticity. Thinking about it logically I would not destroy the LE10a without knowledge of other real options. Also I have not used the after market 2121 recone kit but people are using that option where a reform is not an option. I have heard that sometimes JBL do run of recone kits like the 2121 so I would not entirely rule it out. But you can't buy a recone kit from JBL as it has to be installed by a JBL authorised service agent to meet JBL warranty. I would PM member Edgewound to get clarity on what other baskets can be used to make a 2121? I have a contact that are able to order parts from JBL, so If they are on stock at JBL I can usually get my hands on them. But 2121 is out of stock. I am looking towards making a 2122H from a 2123 basket (I have a couple of these, with damages cones but in otherwise good condition). I think I'll stick with the 2122H until I find a 2121. I am as of now trying to get the 10" and 15" secured, as soon as I have those I'll start on the enclosures. I wish there were detailed plans on these, but I haven't been able to find good plans, so it is reverse engineering based on pictures, drawings and the plans for other speakers on here. for example, I have the very extensive drawings from Odd for the 4344 cabinets, and measurements like panel-thickness, trimpanel and so forth should be identical between these. Concerning the 2122H you will need to use the new equivalent 3145 crossover. For those watching if you are considering jumping from the 4343-4344 on the fly l will be able to answer your desire soon. Thank you very much, for the link to the baffle plans! 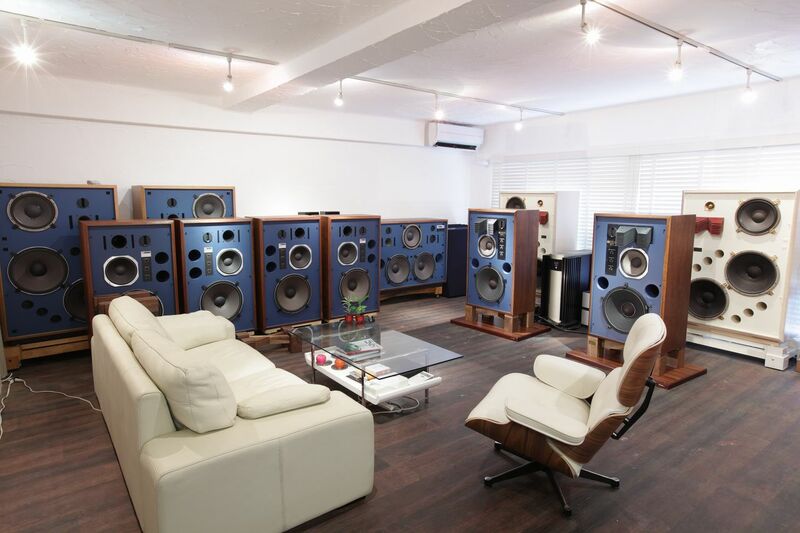 I assume the thickness of the plywood is kept the same across different 43XX speakers? I am going to peek inside a pair of 4333X soon, (Mining-style, with headlamp and everything ) and will be able to measure baffle thickness, trim overhang and side thickness from that pair. I'll go with the 3145 network with Giskard's list. That'll provide a good platform. I will however try to find some of these parts locally, as it might be very expensive to ship everything from, rather than finding the stuff in Denmark/Europe - but let's see. From the diagram it seems the 5.4mH is an iron core coil, but the parts list Solen component references an air coil (the L125.6)? As l recall Jbl used a 15 ply baffle. Once you get your Jasper router jig set up let us know and post some pics. My suggestion is do some practice cuts and don’t rush. I personally found the baffle the most tricky aspect of the construction. I would use mdf or veneered mdf. I think I'll go with particle board for the sides at least. I'll make a lot of tests and sample them to the 4333 I have a chance of visiting. Lets not do the MDF thing , OP is in Denmark , Baltic Birch ply is commonplace and the dust won't kill you. From memory baffle is 25mm and the sides and back are 18mm with substantial. bracing. Just as a second thought , why not DSP the whole shebang. M4 !! DIY Project for clone 4343: Use LE14, LE10, 2470 with horn and 2402 are possible? To clone or not to clone? 4344 vs. 4345 vs. XPL-200 Advice will be appreciated.